Posted on 5th October 2018 at 1:09 pm. Not all of us has the luxury of owing our own garden, particularly if we live in an inner-city area or own a flat or apartment. Even so, you may be lucky enough to have your very own balcony or roof garden. Whether large or small, there are many ways to transform your space into a relaxing oasis away from the hustle and bustle of city life. In our latest article, we’re looking at some of the ways in which you can do this, to hopefully inspire you to take action today. Not all of the ideas on our list cost a fortune, either, and by using a little imagination, you’ll find that you can create an idyllic balcony or roof garden for very little expense. So, let’s jump straight in with the first idea on our list of 8 ideas to transform your balcony or roof garden. The problem with many balconies and roof gardens is that, all too often, they are sheltered from the sun for large parts of the day, particularly if they’re north-facing. This can make growing plants difficult, but that shouldn’t stop you decorating your balcony with lots of brightly coloured flowers and plants. What was once a bit of faux pas is now commonplace – that is, the use of fake plants if you’re struggling to grow the real thing. The quality of faux plants has made great strides in recent years and it’s now very difficult to spot the difference between real and fake. 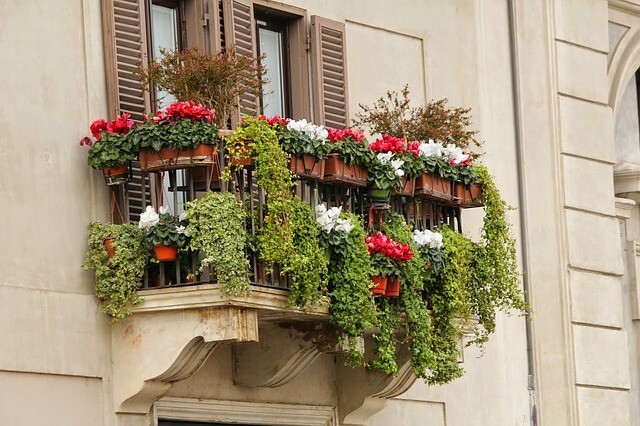 Best of all, they will look stunning all year round and, of course, will not require any maintenance at all, making them an ideal way to transform your balcony. Installing a hammock would be a quirky addition to any balcony or roof top garden. 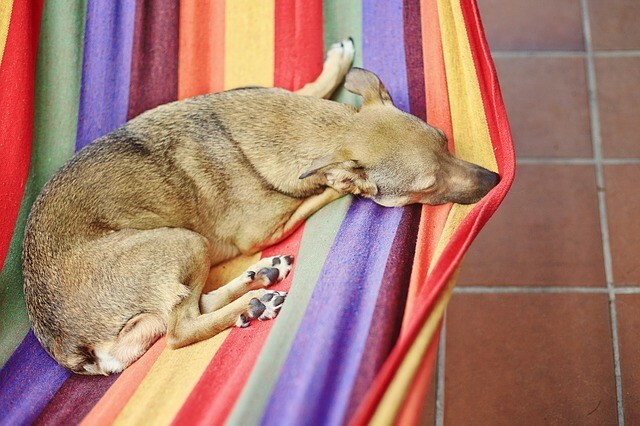 You may be surprised to hear that there are, in fact, lots of benefits of sleeping in a hammock, too. According to one study, published by Current Biology, being in a hammock can help you to fall asleep faster than you would in a bed. It makes sense when you think about it, too, as parents, of course, have been rocking their babies to sleep since the beginning of time, and this is replicated by the gentle swaying of the hammock. It has also been claimed that this gentle swaying results in a deeper sleep which, in turn, can help improve your mood, help repair tissues and muscles, and perhaps even cure insomnia. And, of course, they are not just good for sleeping in – many people love relaxing in a hammock with a glass of wine or a good book, and just enjoying being out in in their cosy outdoor space. Just be careful to properly secure your hammock and take care that you don’t fall out! Artificial grass is absolutely ideal for balconies and roof gardens. Any outdoor space should have as much green as possible to help create a relaxing and natural environment. But the problem is, growing real grass on your balcony is hardly practical, is it? That’s where fake grass steps in. Artificial grass is perfect for balconies and roof gardens. It requires very little maintenance, is completely permeable, to allow any rainfall or spills through the turf, it is soft and comfortable to walk and sit on, and it has the ability to transform any roof garden or balcony, large or small. Some products, such as Tempo, are designed specifically for balconies and roof gardens. It is quick and easy to install, too, and you can even add a soft foam underlay beneath your artificial turf to create a luxurious feel to your artificial lawn. For help choosing the best fake grass for your balcony or roof garden, check out this guide. One of the biggest pleasures of owning a balcony or roof garden is that you’ll get to spend pleasant summer evenings relaxing with a glass of wine or enjoying your breakfast or dinner in your outdoor space. But, of course, every balcony needs tables and chairs for you to be able to do this. With spacing at a premium, you may find it best to buy folding furniture, which can quickly and easily be folded up when not in use, to create additional space. This doesn’t mean that you’ll be limited in your choice of furniture. There are many different styles and designs of folding furniture available and you’ll be sure to find something to suit your balcony or roof garden – and your budget. With space being in such short supply, it’s important that you utilise every available square inch, and that includes your walls, too. There’s lots you can do to your walls to make them more interesting. You could, for example, install a green wall, either natural or fake. 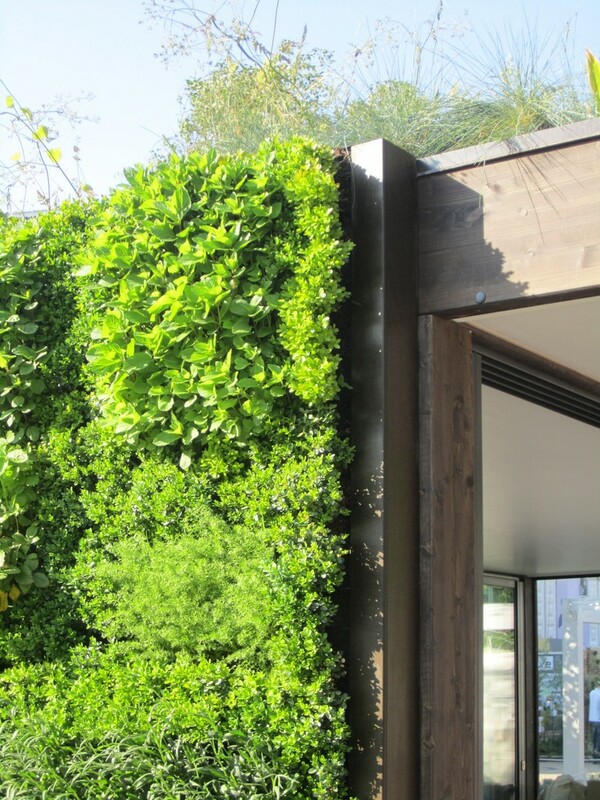 Green walls have rapidly grown in popularity in recent times, so why not join the trend? Or, if covering your entire wall in greenery is too much, how about just installing a few planters or hanging baskets? Maybe you could install shelving and then add interesting items – decorations and ornaments, or small plant pots? You could even add a mirror, to create the illusion of more space. There is a vast array of differing styles of railing that you can install on your balcony or roof garden. Recent fashions are leaning more towards glass panels, to let in maximum light and allow you to utilise your view, as well. And, of course, you can opt for traditional iron railings or even brickwork. 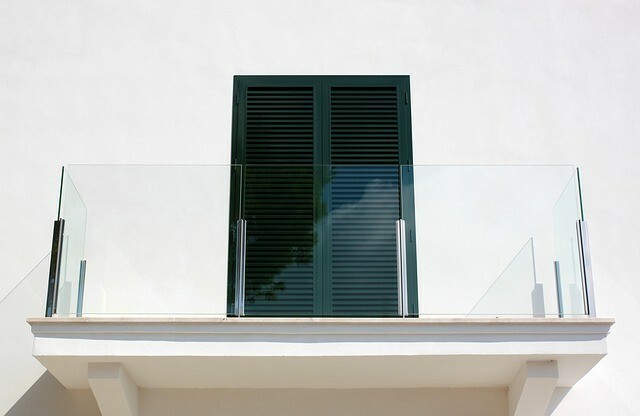 Whatever your preference, you’re bound to find something to suit your tastes and having a new railing installed is sure to have a big impact on the aesthetics of your balcony or roof garden, too. 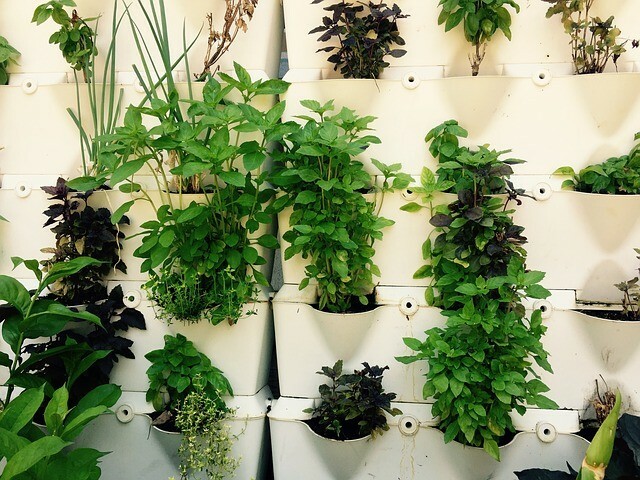 You don’t need acres of space to grow your vegetables or herbs. Just a small planter is big enough to grow some fragrant herbs that will not only smell nice, but that you can use in your cooking, too, and they will also be close to hand when you need them. The advantage of being up high is that whatever it is that you grow will be less likely to be affected by pests. Creating a mini allotment is easy – and rewarding, too – so why not get your hands on a small plant pot and get growing! If you own a balcony or roof garden, you will more than likely love spending warm summer evenings outside, either relaxing or socialising with family or friends. One of the best ways to enhance the experience even further is to incorporate some lighting, to make your outdoor space extra cosy. There are many different styles to choose from, such as spotlights, chandeliers, floor and table lamps, or light bulb chains. Use your imagination when it comes to lighting and you’ll find that creating ambience and giving your balcony a warm and inviting feeling is actually quite simple. Although our list contains 8 ideas, to be honest, you are only really limited by your imagination when it comes to transforming your balcony or roof garden. And, just because you don’t have a garden, it really doesn’t mean that you can’t have a beautiful outdoor space to enjoy all year round. We hope our list of ideas will help inspire you to transform your dull balcony or roof garden into an inviting outdoor space that’s perfect for relaxing or entertaining friends and family. Do you have any other ideas that we haven’t included on our list? Then we’d love to hear from you. Why not join in the discussion and add your comments and suggestions below?